Easily replaceable elastic keeps your diapers fresh. Cloth diapering has never been so easy! bumGenius One-Size Cloth Diapers feature our trademarked butterfly closure system to provide a comfortable, trim fit. This simple design makes cloth diapering as easy as using disposables. The familiar design makes bumGenius one-size cloth diapers perfect for care providers who might be resistant to cloth diapering (including daycares). Less Clutter bumGenius One-Size Cloth Diapers fit most babies from 7 to 35+ pounds. No more sorting by size or having to carry multiple diapers when going out. Three snap-downs on the front of the diaper allow you to easily adjust the size of the diaper as your baby grows. For newborns, fold down the insert stopper for an extra-small rise. Only the Best for Your Baby The soft, waterproof outer fabric keeps the diaper trim on your newborn and toddler. 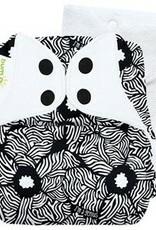 Soft, sueded inner fabric gently wicks moisture away from your baby's skin. Super stretchy, gentle leg and back elastic with rolled out casings keeps the yuk in and help to keep red marks away. Our unique covered slot opening keeps your baby protected from moisture. Product Warranty bumGenius, Flip and Econobum products carry the best warranty in the industry. Read more about the warranty details. Feel confident in your purchase! The Cotton Babies Satisfaction Guarantee gives you 30 days to evaluate your purchase of most bumGenius, Flip or Econobum products. Read more about the satisfaction guarantee. U.S. Patent No. 7,629,501; 8,062,276; 8,518,007. Other U.S. and International patents pending.